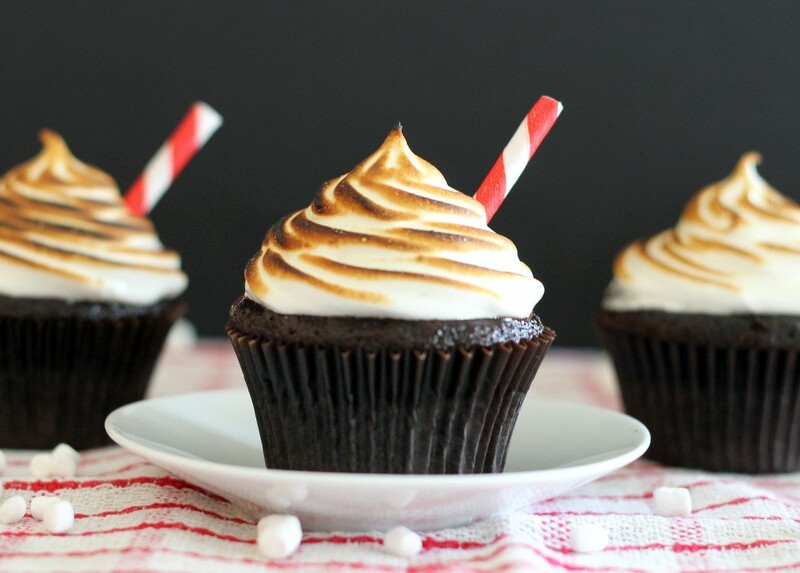 These Hot Chocolate Cupcakes are topped with a fluffy, toasted marshmallow frosting! You’ll love these decadent cupcakes that taste just like hot chocolate. It’s so weird that winter is technically starting to come to an end, because that means soon it’ll be time to start abandoning SUPER chocolatey desserts and embracing fruity ones, not that that is necessarily a bad thing. I mean, embracing spring did give us Lemon Meringue Cupcakes, Blueberry Oatmeal Crumb Bars, and this Summer Berry Tart, and there’s nothing even remotely bad about any of those. However, I’m still in winter mode, so I’m giving you more chocolate…and I will keep giving you chocolate, until someone tells me not to. And trust me…if you make these cupcakes, you’ll be glad I did. 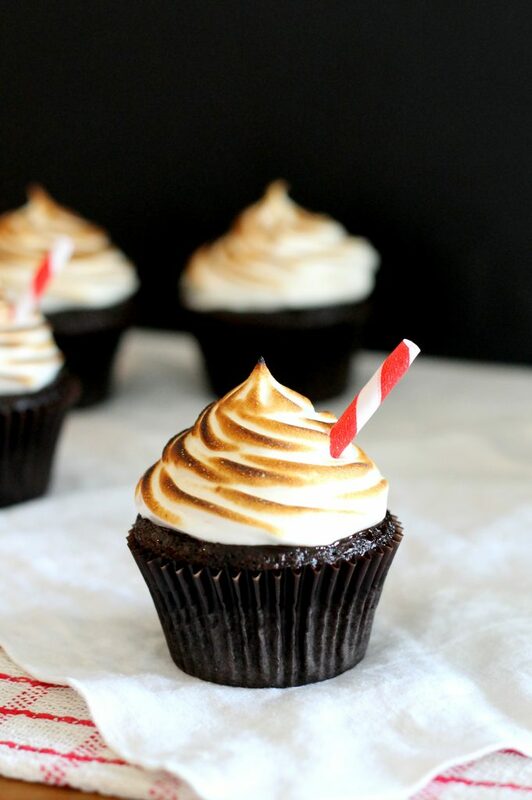 They epitomize everything you love about drinking hot chocolate snuggled on the couch, except in cupcake form, and the marshmallows don’t disappear into the warm liquid. Instead, you have a mountain of glorious, toasted marshmallow frosting. Even better than the drink. These are a spin-off of a recipe I posted waaaay back in Bakerita’s history – Hot Chocolate Layer Cake, from September 2010. I halved the recipe, turned it into cupcakes, and added some amazing Seven Minute Frosting, which I proceeded to toast to make it even better. This, my friends, was a good idea. They’re so delicious and reminiscent of those delicious flavors always associated with winter and snuggling up on the couch with a good movie. Make these next time you’re craving chocolate! Enjoy. 12/18 NOTE: I've had some readers tell me that they've had issues with their cupcakes falling in the centers, even when following the recipe exactly. I've never had the issue and other readers have also had success, so PROCEED WITH CAUTION! I will be fixing the recipe to be more foolproof ASAP. Heat the oven to 350°F. Place cupcake liners into cupcake pans. In a large, heavy saucepan, combine the butter, oil, chopped chocolate, and 1 cup water. Heat over medium heat until melted and fully combined. Whisk in the eggs, one at a time (making sure to keep whisking - you don’t want the eggs to scramble), then whisk in the buttermilk, vanilla, baking soda, and salt. Fill each cupcake liner about 2/3 full. Bake cupcakes for 17-22 minutes, or until a toothpick comes out clean when inserted into the center. Cool on racks for 10 minutes. In the heatproof bowl of an electric mixer set over a saucepan of simmering water, combine sugar, corn syrup, 1/4 cup water, and egg whites. Cook over medium heat, stirring frequently, until mixture registers 160 degrees on an instant-read thermometer, about 2 minutes. Attach bowl to a mixer fitted with the whisk attachment. Beat mixture on high speed until glossy and voluminous, about 5 minutes. Beat in vanilla. Use immediately. After frosting, use a handheld kitchen torch to lightly toast the top of the frosting if desired. I would eat these cupcakes, regardless of what season is – they look so delicious! And your frosting is PERFECTLY toasted! Marshmallow frosting on a chocolate cupcake is a perfect combination. It just is. Oh they look so gorgeous! I like that frosting especially! All your recipes are making me hungry and your photos are so artistic and stunning. I wanna dive in to each one!!! Oh my gosh these are crazy amazing. Beautiful photos! WOW! those looks so good! I love the toasted frosting! And thanks for leaving a comment on my blog! Glad to have found you and your amazing treats! That first picture!!! Dyyyying. These look so freaking amazing, I just want to dive through my screen! These cupcakes look so beautiful! Like snow covered mountains! you are amazing. These are absolutely perfect! These looks amaze! You’re frosting job is utter perfection and I still can’t get over how much I love the design of your blog. Every time I stop by I get a little jealous of how cute it is and how much personality it has =). My goodness, where have these been all my life??? These are too darn cute!!! I love how you toasted the marshmallow. It looks perfect. Have a great weekend! Your blog is so beautiful! I love your photos!! I am in love! The chocolate-mallow combo is unbeatable! Cannot wait to make these. These have to be the cutest cupcakes I’ve ever seen. :) The gorgeous torched frosting on top has me dreaming of a huge cup of hot chocolate and toasty marshmallows. I love your photos! You have such talent. I want one of these cupcakes for lunch. Maybe two of them! Alright, these might be the cutest cupcakes in the world. They look ridiculously delicious too! Mm, that almost looks like meringue on the top! I’m ready to cook these hot chocolates in the kitchen! Beautiful photos! I live in Australia, and we are coming to an end of our summer now. These would look so perfect for winter (or any other season really). I saw these all over the foodies sites and on Pinterest and have to say…AMAZING job on them. WOW! Pinning! Hi Taylor, what do you mean they fell? If you mean that the centers sunk in, that’s most likely because you didn’t bake the cupcakes enough or the oven was at the wrong temperature. I’m sorry it didn’t work out for you! My first batch fell too but I let the batter sit and stirred it two or three times. I think this is an altitude problems because Seattle and San Diego and fairly close to sea level. I live at 5,500 ft and letting the gasses escape from the batter helped significantly. Thanks for the helpful reply Shelby – I often forget about altitude problems because I’ve always lived practically at sea level! Your tip is very useful! Wow I see lots of comments about the pictures and how awesome they sound, but I want to bake these. Did anyone bake the darn cupcakes, and knows how they taste? Interesting, I’ve made these multiple times before and I’ve never had that problem. Multiple problems can causes cakes to fall, like overmixing, undermixing, temperature issues…so I can’t ensure how exactly why it happened for you. However, since these cupcakes aren’t working for you, you could try the frosting with any chocolate cupcake recipe and get similar results! I just made these cupcakes. I weighed the flour and did everything exactly as called for, even with an oven thermometer. They fell horribly. Every cupcake fell worse than any I have ever seen. I would highly not recommend this recipe, they looked adorable and I was so excited, but totally not worth it. Hi Hannah. I’m so sorry you had trouble! I know how frustrating it can be to have a recipe fail – I wish I had been in the kitchen so I could help troubleshoot. I’ve made this recipe a few times (though it has been a while) and never had that issue. I apologize the recipe didn’t work as expected – I’ll try making it again soon to see if I can rework it to make it more foolproof! I just found your blog today when I was searching for hot chocolate-flavored desserts for my Hot Cocoa Dessert Bar post. Your recipes and photos look amazing and I’m your newest follower! I can’t wait to pour over your whole site soon. How many cupcakes this recipe make? I cannot WAIT to make these for my company party this Friday! May I ask how many cupcakes this recipe will make? Just need to know if I should double it or not! I tried these out and, unfortunately, they didn’t come out anything like your photo! They completely sank while baking and they tasted like oil! I followed the recipe exactly (even double checking as I went) so I have no idea why they turned out so badly! I had to throw them and the leftover batter out! I was so disappointed. Now I don’t have a dessert for my holiday party tonight! Hi Elizabeth! I’m so sorry you’ve had trouble. This recipe has gotten mixed reviews – I’ve heard from people who experience the same problem as you and others who it works perfectly for. I’ve made it multiple times and never experienced what you did, but it’s on my to-do list to rework the recipe to be fool-proof. I’m so sorry it didn’t work out for you. I know how frustrating it is when this happens. I’m going to put a note of warning on the recipe – again, my apologies. The problem with cupcakes/cakes/quick breads falling in the center is likely an altitude issue. I live in Colorado and automatically cut any leavening agent in half in a recipe that isn’t already adjusted for high altitude. The higher the altitude, the faster your cake will rise. When it rises too quickly the center falls. Cutting the leavening agents (baking powder/soda) in half allows the cake to rise at a slower rate. I will generally mix my batter, bake one cupcake then adjust my ingredients accordingly if it doesn’t come out right. If they still fall after adjusting the leavening agent and since my batter is already mixed, I’ll add a little more flour until they come out perfect. This cupcake looks delicious! Thanks so much for sharing your insights to baking at high altitude, since I’m so unfamiliar with it! I’m sure this will be very helpful to many people.